The Holidays are such a delicious time of year! I'm sure this list will grow, but I've already got some amazing holiday recipes on the blog. From appetizers to a special cocktail, there's all kinds of stuff. The one thing you won't find are desserts. How is it possible? Well, I've got an entire post that is full of holiday treats! In 2017 I did a series of treat recipes over at Edible Baja Arizona's blog, so there’s a round-up of all of those recipes, as well as a brand new cookie recipe (more updates coming soon). Alright, now let's plan that menu! Serve this with all kind of fresh veggies and crudités for dipping. More dip for more veggies. And this is perfect to make ahead! My favorite thing to dip in this deliciousness is plain potato chips! This gives you 3 dishes with such little effort, and while it cooks all day, you can focus on family. This gorgeous, and delicious dish will wow your guests! This is major comfort food, perfect for winter holidays. Maybe a turkey is a bit bigger than what you need, this flavorful, crispy chicken will hit the spot! Is there anything better than a fantastic slow cooker meal?? This showstopper is simple to make ahead (just cook the pasta fresh) to please your whole crowd! This lighter option is SO gorgeous, and so easy. This will turn anyone into a Brussels sprouts lover! My favorite version of cranberry sauce, it’s SO underrated. YUM! Classic. Delicious. Perfect to make ahead! Also: bacon. 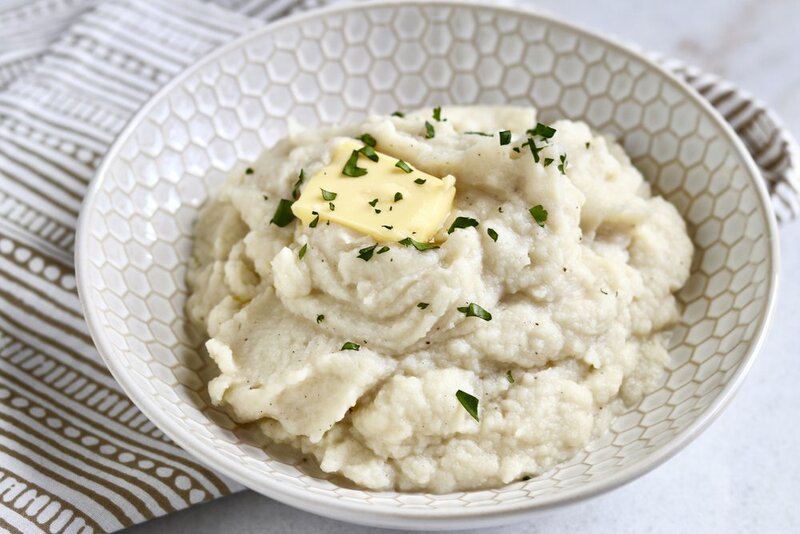 Sure, it’s is a simple low-carb version of mashed potatoes. But it’s also totally yummy in it’s own right. Move over marshmallows! This is topped with the sweet/salty combo of pecans, dates, and bacon! Swap out the mashers for smashers! Crispy goodness. Keep your holiday simple with this quick and easy side dish. Leave the cream of mushroom soup at the store. Try these flavorful, crisp beans instead! I love a mule, and this wintery twist on the classic is sure to be a crowd pleaser! Is there anything better on a winter night than a mug of rich hot cocoa? No. Except this. Rich, creamy, cinnamony, the perfect end to your holiday weekend. Plan your holiday dinner by mixing and matching all of your favorites! Many of the side dishes and appetizers can be made in advance, and just warmed up on the holiday. Combine those make-ahead dishes with a slowcooker main dish and you've got yourself one stress-free holiday feast! If you decide to make any of these recipes, snap a picture for Instagram and tag me at #ideatthatfoodtoo. Have a delicious holiday season!